SUNDAY, June 18th. Some of us went in last night to Verdun and on to Bras, learning the roads. As we left Souhesme the whole west was a sheet of crimson clear to the zenith and in the heart of it a flash­ing cloud of shrapnel about a Taube. The guns in front were firing slowly; through the blind dust of the highway the varying procession roared by, camions, artillery, staff-cars, and ambulances, crowding and dodging in endless array. We passed through two little villages, at the entrance of which gendarmes forced the traffic into single columns—through the dust and fall­ing darkness it was hard to see if they had suffered any damage—then across the narrow-gauge tracks the half-demolished suburb of Glorieux. It is an insignificant collection of modern brick villas and gar­dens suddenly raised to the dignity of tragedy. We had left the main artery and were traveling now alone and, of course, without lights. The road, swing­ing in a wide curve, crossed the main tracks on a viaduct with a sudden pano­rama of the valley. Opposite and very close rose the dark ridge of St. Michel along whose crest the white flashes of the cannon, stabbing the darkness, rippled back and forth like running scales on some Titan keyboard. One's blood sang with the sheer beauty and thrill of it. The next moment we had plunged amid a blackness of trees, through a gate in a moated wall, and into Verdun. In the grayness of night it stretched about us, empty of any life, wrecked, demolished beyond belief, its lanes of tumbled ruins echoing and reechoing with the crashing thunder of the guns. It seemed only a moment and then, as we passed through the farther gate, I looked back from the bridge—a tranquil river shaded by trees, a medieval gateway dark against the sky, and the moon just creeping over the ridge. We quickened our pace for Dead Man's Corner, swinging in beside a galloping battery in a hurricane of dust, and drew up in the long street of the Faubourg Pave. The noise was deaf­ening, but of the dozen or so men standing about the poste de secours no one seemed to heed it. In a few moments the first contingent of us started on. I could tell very little of Belleville save a general atmosphere of wreckage and a smell of half-buried decay—our fears of living here were certainly unnecessary. The fire of the guns had slackened; the river battery under whose muzzles we passed was silent; and on the hill by the quarries we could give our attention to noting the position of the larger shell-craters in the road. On the upper plateau, save for the moving soup-kitchens distributing to their throngs of soldiers, the road was unex­pectedly clear—of how long it was I could form no idea. Then came a little wood of broken trees and Bras. Two great shell holes like Scylla and Charybdis guarded the entrance, and beyond opened a vista of huddled ruins, formless heaps of debris, and tip-tilted roof-beams; the ground was every­where plowed and cratered; the reek of carrion was in the air; and over it all, be­tween the tangled rafters and reflected in the rain-filled shell-holes, the pure-white floating star bombs shone and flickered and died. By an angle of masonry against a sandbag barricade sat some hastily ban­daged wounded, awaiting their ambulance, and across the way lay two dead horses in a heap. Leaving the machine only a moment to be shown the abri [bomb-proof shelter] and dressing station in the tunnel vault of a cellar, we started back for the Faubourg Pave. The fire had quickened again and the road was more crowded. By the quarry hill, seemingly a favorite target, we narrowly missed a train of artillery charging blindly through the dust up the left of the way. While waiting for the second squad to make its trip I groped my way through the dark corridor of a house to the rear gardens, where already I was clear of the town. Above me rose the Cote de St. Michel, its crest seeming to be on fire with the fury of its guns. Somewhere to the right on the low ground a battery of larger pieces was crashing at slow intervals —each discharge felt like a blow against the body and was followed by a sound like tearing silk overhead, mounting and fading into the general inferno. Our river bat­tery had gone into action, and another, beyond a group of buildings in front, threw them into black silhouette with every discharge. The upper air was alive with the sound of their projectiles, whining, whiffling, tearing, and every now and again, growing from the chaos of it all, a crescendo shriek ending in a crash over­head or behind. From time to time red rockets rose from the volleying crest of the ridge, but one could not guess their mean­ing; always from the darkness came the smell of unburied things—Verdun—will one ever forget it? June 21st. We moved to-day to Bally-court, five miles from Verdun, and are camped beside a field hospital there on a long green slope above a marsh. We take over the regular service to-night. June 22d. Twelve of our men were out last night on the Bras service and struck the edge of a gas attack. H— gave me a cigarette this morning from the case he had carried, but it reeked so of gas that I couldn't smoke it. The air here was tainted with it all morning, but whether from the patients or from the occasional shell that struck in the woods above I could not tell. The gas patients were terrible those less affected coughing and choking continuously, but the others were far beyond that. 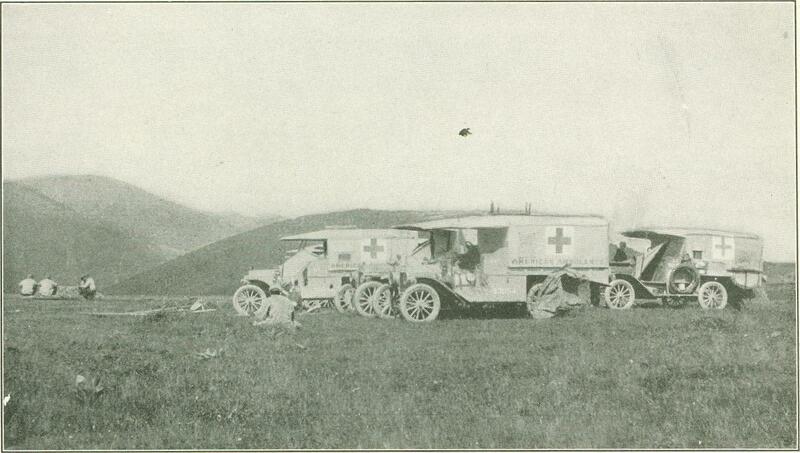 Three of our cars brought them and the wounded in from Verdun, and two of us took the less desperate on to the evacuation camp at Queue de Mala; the others went down the hill on stretchers —uncovered for treatment or with blank­eted face for burial. 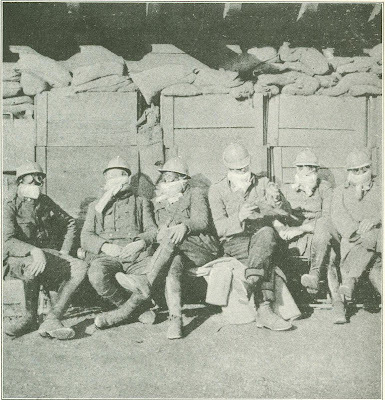 After twelve hours' work and about ten trips apiece we came in for supper, utterly unrecognizable in our masks of dust. About nine o'clock twelve of us drove in to the Faubourg Pave and on in groups of two to Bras. Though the French fire was much less intense than on my former evening, a good deal was coming the other way and the road was very congested. One of the big guns of the river battery went off, with an almost stupefying effect, directly in my face, and in the echoing blackness which-followed my car careened down into one of the shell craters which here and at the entrance to Bras make the road almost impassable. On the out trip, running empty, if one does not strike shipwreck they don't matter, but coming in loaded with badly wounded men they are horrible. On the second trip, with intensely dramatic effect, a violent storm of thunder and lightning merged indis­tinguishably with the roar of the guns, leaving between the flashes a blind wall of darkness and of rain. On the quarry hill a stream of lightning showed one of our cars directly before me. I stopped short, blowing my whistle, and the next moment we struck. There was an exchange of names in the dark and an investigation of damage, each of us seeming anxious to appear the more courteous and cool. It was M, who is blind as a bat in daylight without his glasses and whose pres­ence on that road in the storm seems to me true bravery. I backed a few feet downhill, and as both cars would crank we concluded they would do. By now it was raining in sheets. At the top of the hill I fouled a large tree-top which the next flash showed me up-ended in the middle of the road—shot down since my last trip—and a quarter of a mile farther on I ran over the legs of a dead horse. In the darkness of Bras, W's voice called over for a helping hand, and I found him with a punctured tire in an inextricable tangle of loose barbed wire. I struggled with him for a while till my car was loaded and others had come to take my place, but the stuff was round and round his rear axle and I was really glad to feel called away. On the third trip they were shelling Bras. June 23d. The morning was spent in mending cars and changing camp to the Bois de Nixeville, as it was thought that our parked cars might draw fire on the Ballycourt hospital. We got some sleep in the afternoon and started at dusk for Verdun. Rather to our relief the dressing station has been moved from the Faubourg Pave into the city, avoiding altogether Dead Man's Corner. On the second run to Bras I was stopped at the Croix de Fer, a wayside poste at a cross-lane without building. 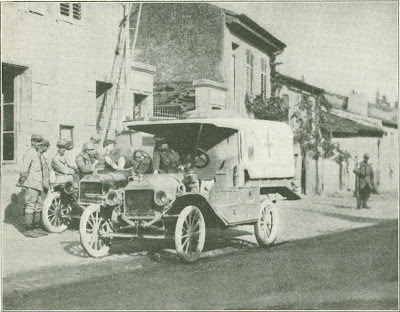 The place was a struggling con­fusion of artillery and soup-kitchens, through which the brancardiers were fight­ing their way to every ambulance, holding to the wheels of those already loaded and demanding room for their wounded. No one was in command. I took on five, some of whom said they had been waiting three days, and I promised to send other cars. The Germans were trying again for the river battery, one eclat singing rather low over my car into the bank of the road. They can't possibly get that battery and I wish we could tell them so. On the third trip, finding only two left at the Croix de Fer, I went on to Bras, which again was under bombardment. As I reported to H --- a shell struck in the ruin behind us, sending a glowing lump of something along the ground to my foot. Another knocked down the last corner of a building across the way. I had left my car chugging in the middle of the street till their fire moved away from the village, and watched its consumption of gasoline from behind the sandbag bar­ricade. There were no wounded to be had—why, no one knew, save that some­thing had held up the service. As I went out to bring in my car a vague procession appeared up the side lane, a score or so dim figures in gray each pushing a two-wheeled canvas cradle, and I stepped close to ask if they had the wounded. Non, ceux sont les morts ("No, these are the dead"), answered one. Poor, broken, swaying things in their huddle of bloody rags, how far they seemed from the thrill of martial music! Then I started back to the Croix de Fer, and I was glad to go. As I cranked, the shelling started again in the upper end of the town, and before I cleared Charybdis a large-calibre one sounded behind me somewhere near our poste. I hoped our men had got to the cellar. They followed me down the road, but one cannot hurry, and I heard them behind me among the trees of the little wood. Beyond, in the open country, a series of star bombs shed a brilliant light, with the shadow of my car black on the road in front, and I felt the eyes of the whole German army on my back. A great deal was passing overhead, some of them a strange form of projectile leaving a brief trail of sparks in its wake. The Croix de fer was again in wild confusion, from which I brought out five wounded, and again the river battery was being shelled. To reach our new poste in the city we cross on a long, wooden bridge too narrow to admit of passing, and here the guard signaled me over, but I met artillery head on in the middle and had to back out the whole way. To my left I heard Dead Man's Corner going off like a bunch of firecrackers, and then at last I reached Verdun. Poor, shell-riddled Verdun! One comes back to its streets of echoing ruins with a feeling of homecoming, of safety, and of relief inexpressible. As I refilled my boiling radiator and changed a clogged spark plug, three large-calibre shells passed overhead into the upper town, but whether rightly or wrongly one feels protected there—too small in the size of the whole city to be struck. June 26th. In the afternoon we heard for the first time from camp the whistle and explosion of big shells down the valley - 210'S I should say—and were timing their interval and speculating where they were landing, when a telephone call came from Ballycourt, under bombardment, for all cars available to evacuate the hospital. 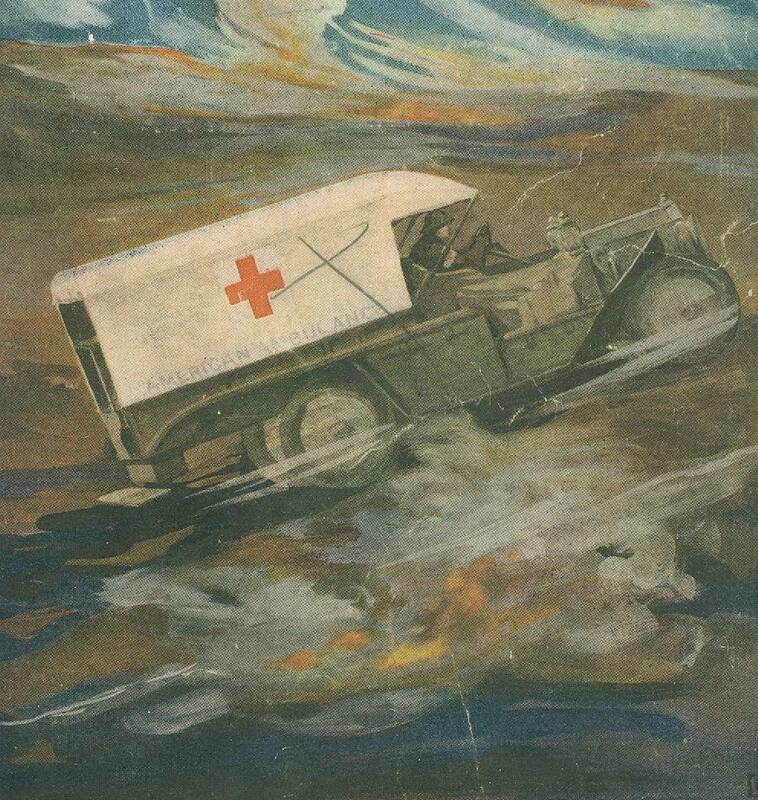 We got there to find the place in a seething turmoil of every kind of vehicle and of bandaged men limping about on each other's shoulders, while a new division of-troops, marching in to Verdun, were blocking every avenue of egress. In the steep-pitched fifty yards of muddy lane that leads between the hospital sheds three wagons were lying in fragments, their splints and bandages scattered broadcast on the ground, eight horses lay dead or dying, and I heard that six men had just been killed. 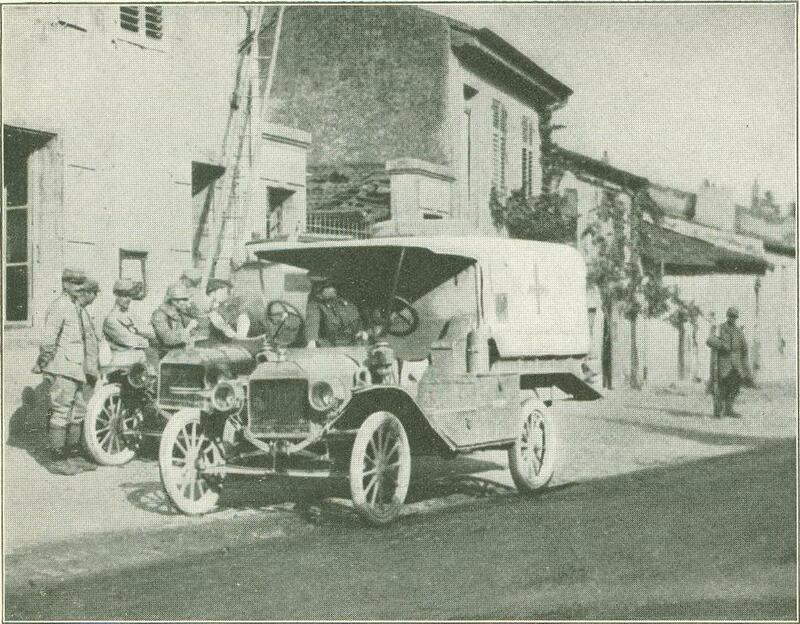 We made our way to the cem­etery, where the wounded were collecting, and, loading to utmost capacity, started back; but as I reached the place where three of the shells seemed to have landed the head of an incoming regiment blocked all possible progress. Why no one held them back or turned them aside I cannot think, save that no one seemed to be in authority or that the man in authority was not there. Minute after minute, crowded together, absolutely stationary, loaded to the gunwales with sick and wounded, we waited for the roadway to clear and for the next shell to strike. Beside my wheels lay a horse still breathing but with both forelegs carried away at the body, and another lacking half its head. When at last the way was open it was found that our procession was headed by horse-drawn wagons which could not travel above a walk, so for three hundred yards to the main road we moved at a snail's pace; but by now the long interval since the last shell had changed from a cause of anxiety to relief, for it seemed probable that the bombardment was over. I took my load to an evacuation camp at Fleury-sur-Aire—a long ride over smooth, empty roads through a green and cheerful country, where flowers grew in front of the cottages and women were. It was like a week-end in the country. I got back at seven-thirty and about nine, I started for Verdun again in the rain. The night set­tled very dark and wet, the road was rather crowded, but it was apparently not being anywhere bombarded, and there were few wounded at Bras. Our kindly old divi­sionaire had placed at our disposal a fine room in the poste at Verdun, and here between trips I was lying down in the corner, when about midnight W came in to say that Barber had been hit in the back—he had heard his voice by the road­side beyond the Croix de Fer and had brought him in. We thought then that he was dying. In the large dark-paneled room, lit by two candles on the central table, we sat about listening to the splash of rain in the paved courtyard. A bran­cardier brought in a canteen of hot tea which we drank as we smoked, and every few minutes someone looked at his watch. A man had been sent to see what was left of the damaged car, and a little later two of us started again to Bras. The rain drove out of a wall of blackness, then the river battery split the night in two, and at the same instant a German shell struck the bank in front. From there on the way seemed to be littered with dead horses and the wreckage of broken carts. At the Croix de Fer, as I dodged between an over­turned soup-kitchen and a white horse half across the road, I was stopped by a desperate group of brancardiers and turned about as quickly as I could in the narrow space. In the darkness in front was just visible Barber's derelict. The sound of shrapnel was almost constant overhead, though where it was landing I could not tell. We lifted in three couches from the roadside, which is all the cars will take, yet the sergeant kept pleading with me to take a fourth. I asked if the man could travel sitting, and he dodged back into the darkness to find out. Then he and another came carrying him in their arms. They lifted him very carefully into the seat beside me, first his feet and then his body, as though they had no relation, and propped him, weak and moaning, against my shoulder. Both legs and one arm were broken. Then the sergeant leaned in to pull an overcoat over the huddled shoulders, and with a cheery "Bon voyage!”' stepped back; at the same instant a shell struck the road behind, and through the crash of it I heard him scream, in the flare of it saw him crumple up on the ground. My car lurched over the neck of the white horse and I groped my slow way out. Through the long ride the figure beside me never complained; only from time to time, as he seemed about to fall and I drew him- back into the seat, his whispering voice would ask how far there was yet to go. At three I started the rearward work to Queue de Mala. Morn­ing comes like the relief from pain. "A LEANING TOWER OF PISA"
In view of the intense bombardment now being undergone the gendarme on duty at this point may, if necessary, be found in the cellar of the house three doors to the right. June 30th. I slept last night, slept twelve hours, and it has made .a world of difference. To-day I was able to do some much needed repairing with nails and rope on my tar. The constant rain has added greatly to the difficulties of our living in a single leaking tent, twenty men with room only for twelve cots, and between them a narrow lane of mud and trampled overcoats. We sleep by shifts, but prob­ably the troops in front do not sleep at all. 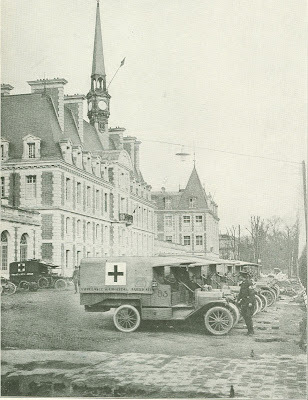 With rumors of fighting at Thiaumont and Fleury, the French ambulance section, which is later to replace us, was lined up beside us at Verdun, doubling the service for the night. The road to Bras was empty. From the top of the quarry hill I heard shelling in front and at the Sap de Belfort found three of our cars drawn up beside the road, but with neither drivers nor brancardiers in sight. Stopping be­yond them, I walked back and called softly. There was a moment's silence; then a voice from below: "Come down, for God's sake. They're shelling h—l out of here." Almost with the words came a quick rush of sound and an explosion on the road covered me with mud. I slid down the bank to where a group was gathered in the entrance of an abri—a sheet-iron roof built into the slope, with a wooden bench and a steep run of earth steps leading underground to a dimly lit chamber. The shelling moved down the road and ceased—short ­range fire, for the whistle and explosion came almost together, and small pieces, but none of them seemed to miss the road. In the lull that followed the other cars moved on to Petit Bras, where some wounded were waiting, and I turned my car about in the narrow way, working the wheels around with my knee. The noise of its motor sounded terribly loud. We were just lifting in the top stretcher when a case of shrapnel burst low over the car with a hiss of bullets beyond. 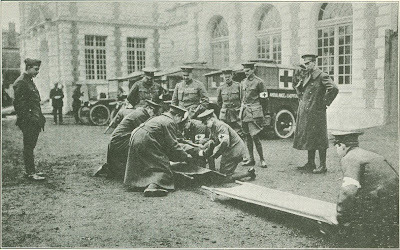 The con­cussion seemed to drive my head down between my shoulders, one of the French­men let go of the stretcher, which canted far over, and the wounded man cried out feebly. Then we straightened it and shoved it in as a second case exploded a little to one side. I hesitated a moment, uncertain what to do, then went down to the abri to see if the other wounded could be hurried up. As I reached the shelter a shell struck almost on the roof, and again the wounded man called out. The ser­geant urged me to go on with him, but I refused to drive nearly empty to Verdun, suggesting instead that we bring him back to cover. The firing had again moved down the road. As we lifted him out, a French car drove up and the driver called something I could not understand. I answered that I could handle the wounded there and for him to go on. The words were drowned in the next explosion and he staggered past me down the bank to col­lapse on his knees against the bench, but almost in the instant started out again in search of his companion driver. We found him, also wounded, in the next sap and, with every one under shelter, sat down a moment to rest. Again the firing moved down the road and ceased, though I could hear it in the direction of Bras. After a lull of several minutes we began reloading, but there seemed an intermin­able delay about getting up the second stretcher from underground. D---- passing with a load, stopped to ask how I was getting on, and told me that the other two at Petit Bras, having tangled their cars in some loose barbed wire, were sitting in a trench of water while the Germans shelled the woods about them—at Bras they were mostly in the cellar. As we started with the second stretcher up the bank the shell­ing recommenced, the first explosion cover­ing us with debris, so again we returned with it and waited. Every now and again came the ringing of stones and metal on the iron roof. With the third attempt we succeeded in loading the body of the car just as their fire opened again, and from the seat I called out to ask if there were any assis to take beside me; but the ser­geant answered: "Non. Partez, partez!" (No. Go on, go on!) One of my spark plugs had fouled, as it often did, and I limped down the road on three cylinders, keeping just ahead of the following fire. There were no cars but D's at Verdun, everything else being cut off by a small-scale tir-de-barrage (curtain of fire), and I was asked to return at once to the sap. I don't hesitate to say that I didn't like going, and as I started back along the empty way I found myself repeating the chorus we had sung those long months ago in Mirecourt: Hardis les gars! C'est pour la France (Don't flinch, boys! It is for France). In Belleville I found one of our men with a broken rear wheel and took off his wounded, glad of the chance to return so soon. When finally I did reach the Sap the road was again normal. The number of dead horses seemed to have increased and one wounded animal, standing broad­side across the way, had to be gently shoved aside with the radiator; what else had occurred I could not tell, save that the two ruins near the crest looked smaller. Back at Verdun in the gray of dawn I found the old court­yard paved with loaded stretchers, while around the sides and in the dark arch­ways stood a silent, bandaged throng—gray helmets, white masks of bandages, sagging muddy over­coats, bandaged arms projecting from be­neath the empty sleeves, and over the whole sodden mass the steadily falling rain. The —th division was giving of its best. We had only one more night at Bras. As I waited for my last load, sitting on the end of the sandbag wall, I knew that I should not come that way again, and I looked about me to memorize the scene. piled debris and wreckage of the house, beams and masonry against the morning stars. The French and German fire was crossing high over­head with the steady sound of tearing silk, and for weeks and months that sound would scarcely cease. I wondered if I should ever return to walk in safety up those dark hills of fear. We were leaving tomorrow, and very soon I was leaving France—leav­ing it with a fading memory of things un­real and with a great gladness that in some slight way I had been able to bring a mes­sage of sympathy to her in her time of agony and travail. From The World’s Work, 1916.